There is nothing better than a little floral romper! This particular number comes from Anjouil’s Boutique, and it might just be the cutest romper ever. I am obsessed with the layered top, which makes this romper look like it is a two piece set. It’s comfortable and cute and I could wear it just about anywhere! It has been my go to throw on piece for wedding errands lately as it is easy to put on and style but still adorable! This is my first piece from Anjouil’s, but I already know it won’t be my last! They have SO many cute pieces! I find myself wanting literally everything on the site…you know you are in trouble when that happens! I think one of the best parts about being a bride is having the excuse to wear white literally all the time! I have a good stash of white dresses in my closet (see a few below), but I have definitely spent hours scouring the internet for the perfect white dresses and white separates to add to my closet for any necessary bride to be outings and occasions! I have rounded up some of my favorite styles and pieces ( a few of which I own…or wish I owned!) for you, whether you are looking for something to wear to a rehearsal dinner or shower or just something white to wear on any day so people know you’re a bride! Just click the picture below of the item you love to shop it! Anybody else obsessing over the cold shoulder or off the shoulder trend? It’s been one of my favorite trends to wear this summer, so of course it would extend to my little white dress collection! Whether you are going for lace, crochet or cut outs, sometimes a little white dress with details is all you need to make a statement! A printed white dress can be a fun option. 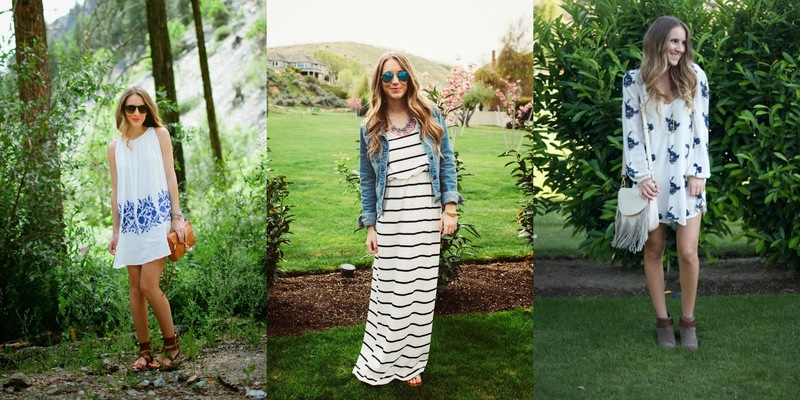 Stripes, florals, polka dots…so many choices! Next Post #WIWT + Wedding Week: Bridal Shower! I love this floral romper! So beautiful and your accessories are always on-point!! Love your romper, and your hat is adorable! I seriously want to get engaged just so that I have a reason to buy cute white dresses. Only kind of kidding, haha! Love the panama hat you're rocking, it's one of my fave summer accessories! Officially obsessed with this romper! I love how you styled it. That hat looks so fab on you! I love this romper and all of your white dress picks. I think you're the romper queen. They seldom seem to look good on people (at least in real life and on me lol lol), but you always look so put together in one. Okay this romper can go ahead and get in my closet, pronto! Cute little romper! I really like that it looks like a two-piece set, since classic rompers don't really flatter me haha. The white dresses are gorgeous, especially the cut-out! You have so many adorable little white dresses. I love the one with the cut outs the most. You're perfect! I love your romper and your hat. Such a great look! I love your romper! I've been loving rompers this summer, you look so cute in this one! I have tried on so many rompers this summer and have not quite been able to find one that I absolutely love yet. Or maybe I am just scared to buy one…haha! Love that floral romper, it's so colorful! Also, I had never thought about that bride excuse to wear white – that's so clever! Cute outfit!! And you look pretty in all!! Okay so, I love every outfit you ever post on here but this wins. Seriously. It's the most perfect summer outfit I've seen. I love that this romper is under $50!! Definitely buying this tomorrow since it's payday, sorry if we're twins! You look great! I'm loving the floral pattern of this romper! Oh my goodness, I'm in LOVE with your little romper! I love the way your white bag pops 🙂 Gorgeous, sweet girl! Hope wedding week is going smoothly! Love the romper! I'm also such a huge fan of little white dresses in the summertime – you look gorgeous! Hope you are having a fabulous week! This blog is just filled with adorable looks. I seriously need to invest in some adorable rompers/jumpsuits. Such a lovely ootd! Soooo cute! Ugh I need that bag in my life ASAP.